This Software works with AIR’s famous Artificial Intelligence to find the best day and time to begin gambling and shows how long your window of opportunity is open! The program makes its decision using your natal chart and the specialized techniques of electional astrology. 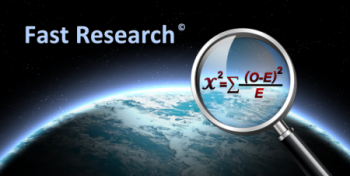 The program allows you to calculate and store thousands of natal birth charts, while the incredible artificial intelligence will weigh out every day of the month and tell you how strong or weak each day is to gamble. The higher the numerical values are on the calendar the stronger the probability WIN. Select the date that you want to gamble, double click on high days the calendar, and our Artificial Intelligence will bring you the exact time to begin and stop gambling. 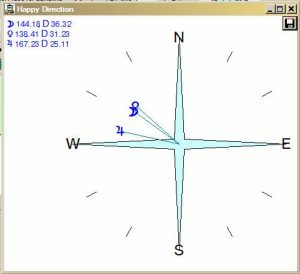 Plus this program has a very special added feature – it points you in the compass direction that will give you an extra winning edge when you gamble. This screen displays the strength for the time to begin gambling. The top portion of the graph shows the strength to your natal chart and the bottom portion displays the strength in the sky. When both of them a peaking you have a higher chance to win. This graph displays a 10 minute window. As you can see 3.10pm shows a light green personal window and a light pink general window while 3.15pm shows a much darker green for both personal and general. Each line between the times given represents one minute. If you were going to play the slots and wanted the exact time to drop in your first coin then 3.16pm through the end of that graph would be the best time to do so because both the personal and general windows are the deepest darks simultaneously. This graph displays a 20 minute window showing you that maximum strength will last from 3.16pm until 3:27 p.m. You could still continue to gamble after 3:27 p.m. because there is a light green bar, but if you start losing it’s really time to quit. Assume you are playing poker or roulette. Here’s how you would use the information in this window. Walk to the table facing your lucky direction (I’ll explain this in detail later). At 3:10 p.m., while the bar is light green, if you have a good hand, or are doing well continue but use caution. Notice that at 3:13 p.m. the green bars are getting darker and stronger so you can be more daring. At 3:16 p.m., however, now you can really get in the game because both green bars are at their strongest. 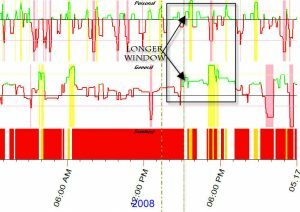 This graph displays 1 hour window. Notice that at 3:54p.m. the personal graph is turning red. This is your time to quit gambling and leave! 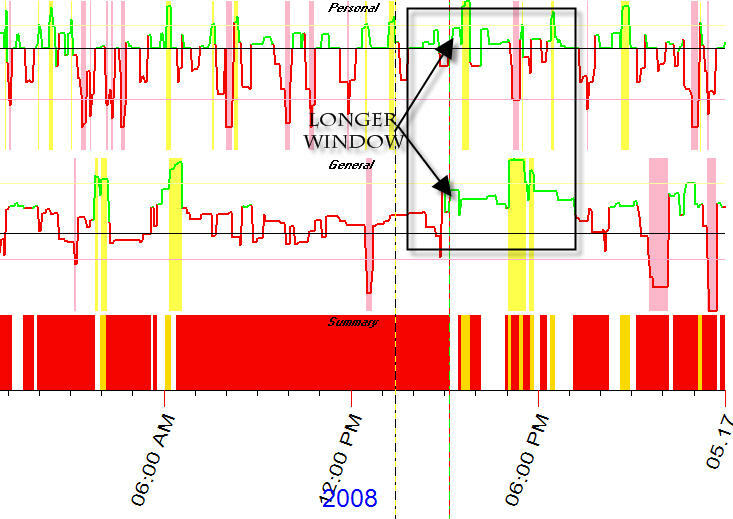 The graph below shows a very important feature in our Gambling by the Stars software. Facing the right direction when you’re gambling is very important. 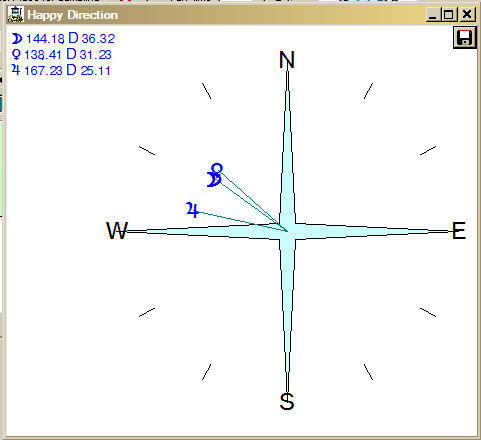 This graph shows you your special ‘lucky’ direction(s) to be facing while gambling! This graph displays the transit strengths in the natal chart to use for gambling and just about everything else in your life. There are many options and settings that you can choose in Gambling by the Stars. If you are gambling outside your native place you can relocate your chart to any where in the world. Calculate your very best places to gamble with the locality map module. 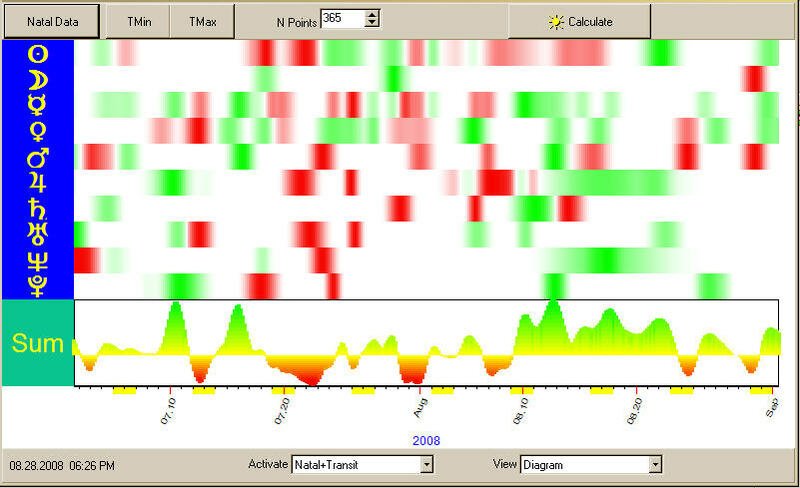 Calculate an instant chart to view and just click on the graph to see the aspects that are occurring at that moment. 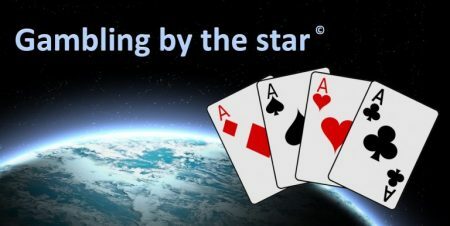 Gambling by the Stars is Just Amazing! Whether it’s poker, slots or casino games this program will give you that special winning edge. This ingenious program, as well as all of our other 24 programs, is only found in air software.